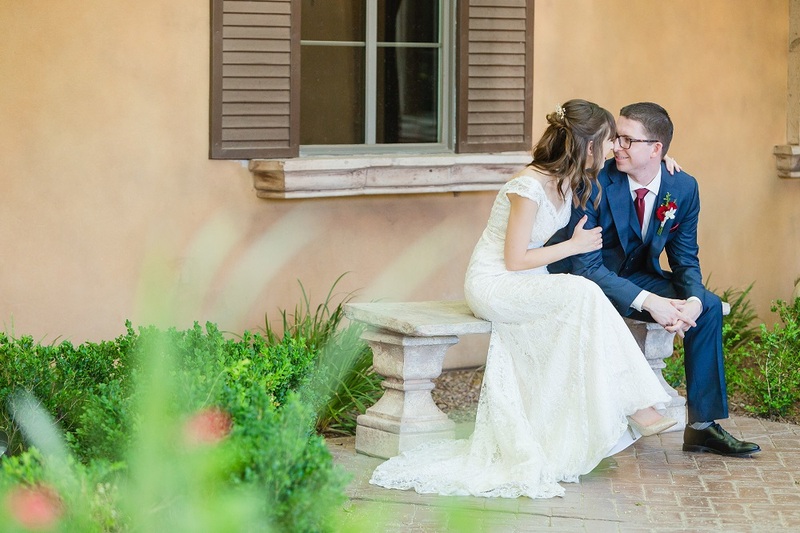 High school sweethearts Kristin and Andrew were married on June 3, 2018. 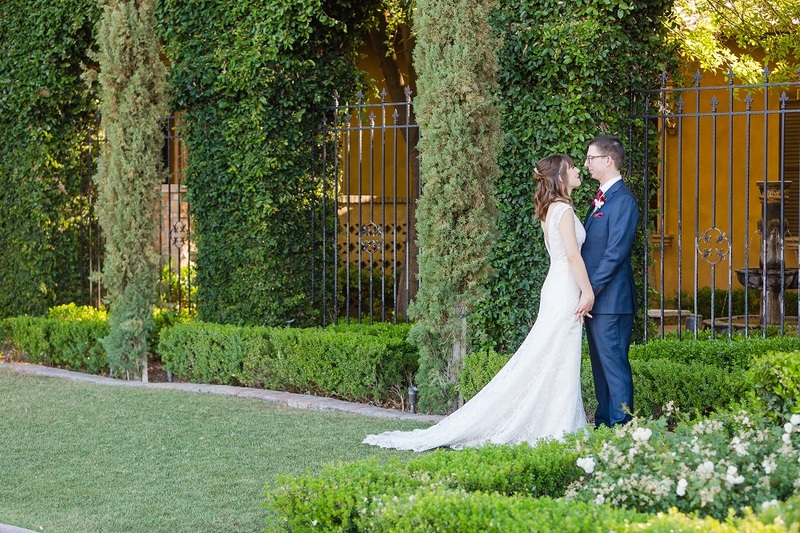 Kristin chose a sophisticated lace sheath gown with cap sleeves, V-neckline and V back, and a train. Her accessories included pearl stud earrings and a pearl necklace. Her large bouquet included red, white, and blush roses along with other flowers and greenery accents. 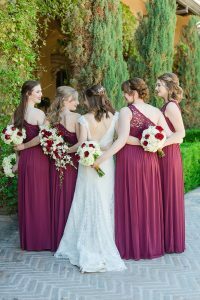 Her four b ridesmaids wore matching one-shoulder full-length burgundy dresses, and carried bouquets of white and red flowers. Andrew got married in a dark blue three-piece suit with a blue vest, white shirt, burgundy tie, burgundy pocket square, and mini bouquet boutonniere. His three groomsmen wore gray three-piece suits with gray vests, white shirts, burgundy ties, burgundy pocket squares, and white flower boutonnieres. 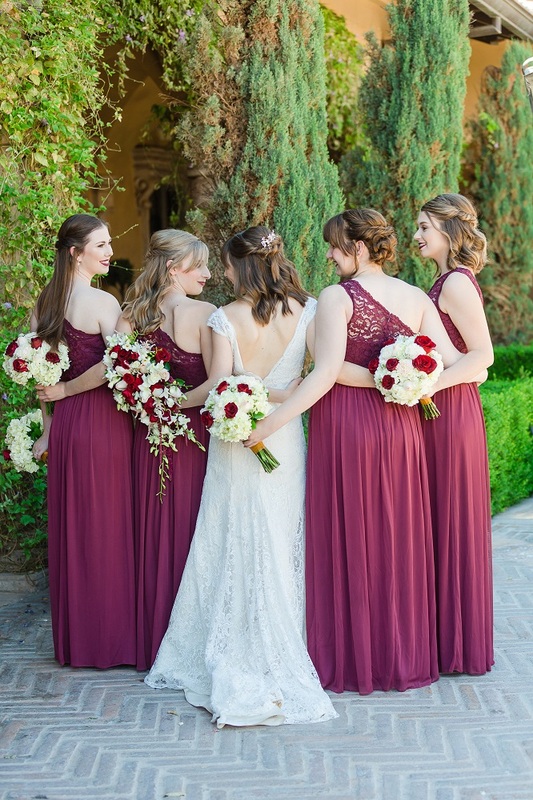 His groomswoman wore a sleeveless full-length gray gown with a V-neckline and a ribbon belt. 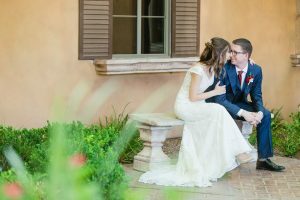 In the indoor ceremony, Kristin, Andrew and their parents mixed together the ingredients for bread, both to recognize the couple’s love of baking together and to symbolize the creation of their new union. Later, at the reception, guests enjoyed a meal of salad, salmon, steak, mixed vegetables, and potatoes. During the speeches, the bride’s parents told the couple that having a loving partner is the best team they can have. The groom’s mother talked about how she has considered Kristin to be her daughter for years now. Kristin and Andrew had their first dance to “Songbird” by Fleetwood Mac. Kristin and her father danced to “I Hope You Dance” by Lee Ann Womack. Andrew and his mother danced to “Landslide” by Fleetwood Mac. 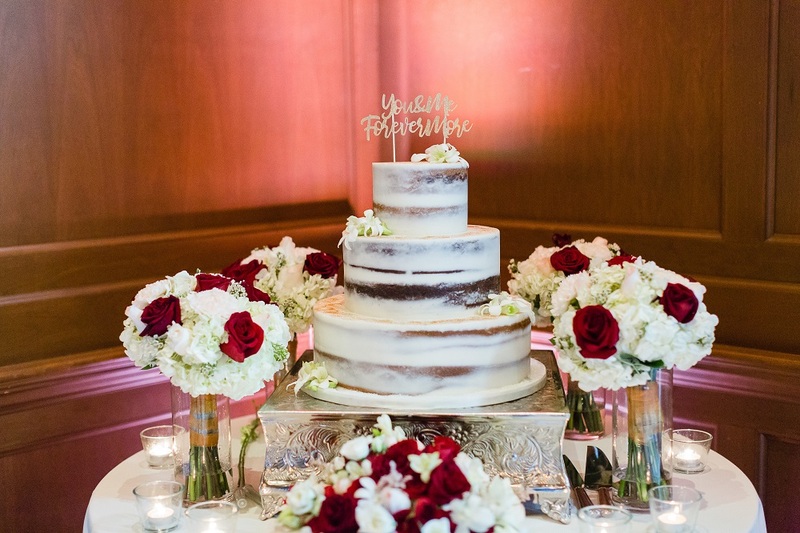 The three-tier naked wedding cake was decorated with flowers and topped with a “You & Me Forever More” ornament. We wish the happy couple a long and joyous life together!